July market stats were published by the NWMLS yesterday. The biggest news is still the climb in inventory, which is up 256 percent from the all-time low that was set back in December. If the current trend continues (a big “if”), it’s entirely possible that by the end of this year inventory will be at its highest point since 2011. The big news in this month’s numbers is yet again the big bump in total on-market inventory. 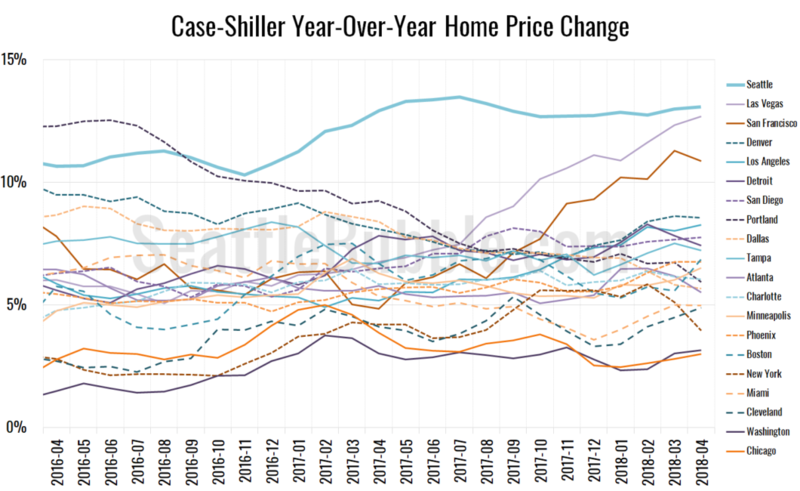 That said, prices look like they’re beginning to soften as well, which is unusual for what is normally the hottest time of year for price gains. 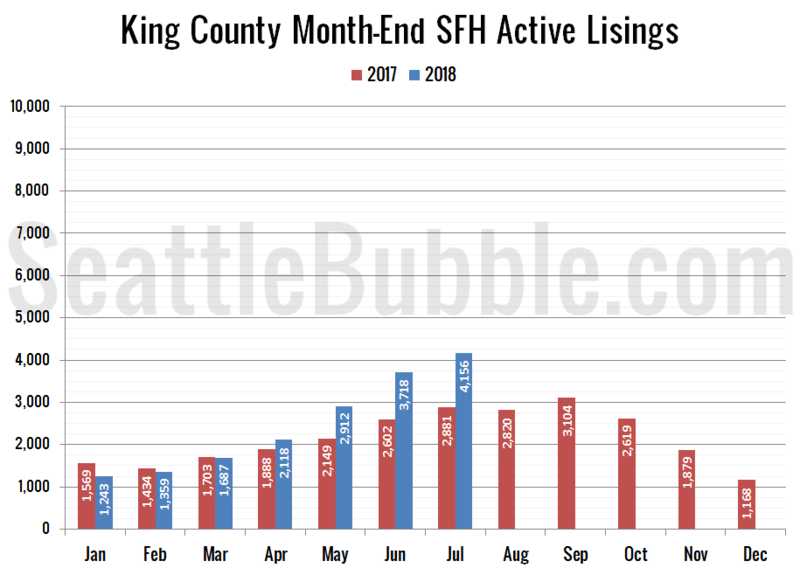 Last month we noticed a big surge in listings in King County in our preview data for May, and in June it looks like the trend is getting stronger. 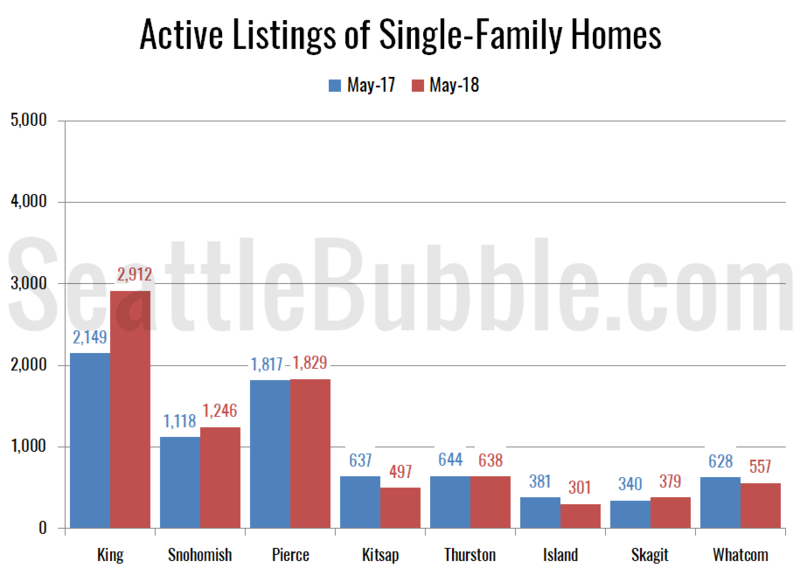 On-market listings of single-family homes nearly hit their highest point in four years in June, surging 28 percent in a single month. The overall summary for June is that sales edged up from May, but saw the biggest year-over-year decline since April 2011. Listings shot up and are starting to form a very interesting trend. Foreclosures are still few and far between. Over the same period last year prices were up 2.6 percent month-over-month and year-over-year prices were up 12.9 percent. Seattle still leads the nation in both year-over-year and month-over-month home price growth. 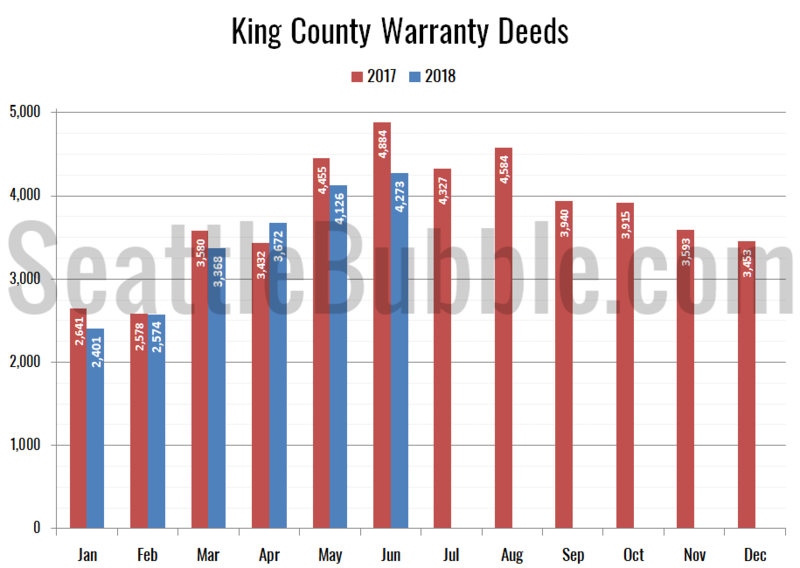 Seattle has had the highest year-over-year price growth since September 2016. The only other metro areas with double-digit price growth from a year earlier in April were Las Vegas at 12.7 percent and San Francisco at 10.9 percent. The big increase in listings is the first interesting development we’ve seen in the local real estate market in months, so here are a few alternative takes on recent home listing activity. 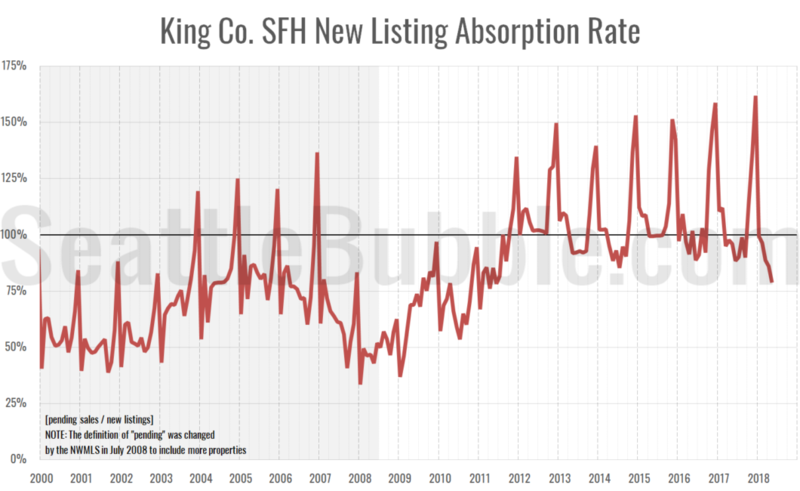 First up, here’s a chart of new listing absorption. This is a simple look at the ratio of pending sales to new listings. 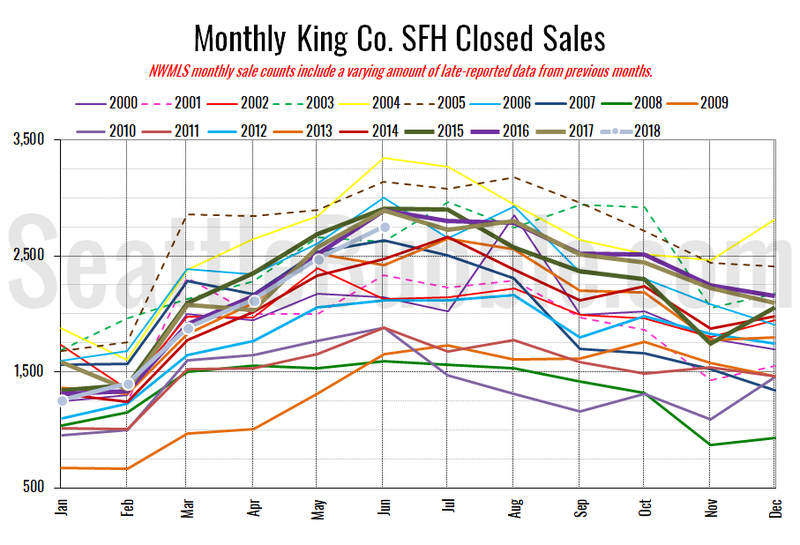 If more homes are going pending in a month than there are being listed, this ratio goes above 100 percent, which is obviously not great for buyers. As of May, the absorption metric has dropped to 79 percent—its lowest level since June 2011. Interestingly, the rate was at its all-time highest level just last December at 162 percent. The absorption rate typically hits its lowest point of the year in June or July, so seeing it drop this low this fast is highly unusual.